With a smartphone in every pocket and video games at the top of every child's (big and small) wishlist, it’s impossible these days to separate Christmas shopping from the latest and greatest gadgetry. But while shopping for tech used to mean a trip to fusty Hi-Fi shops or hunting down black, boring DVD decks, today’s gadgetry can bring aspirational style, inspirational sound and stunning visuals to your living room. Whether you’re talking stocking fillers or show-stopping tech-filled centrepieces, TechRadar's Gerald Lynch brings you the tech-stuffed presents that should be on the top of every Christmas wishlist. When you think of speakers, you’re probably picturing a boxy, mesh-covered cabinet that sits on your shelf. Bang & Olufsen looks to redefine what a speaker can be with its circular BeoSound Edge speaker. About the same size as a car tyre but looking like a prop from 2001: A Space Odyssey, it delivers class-leading sound with innovative features to match its unusual design. As well as offering full 360-degree directional sound from its side-firing speakers and multi-room audio with supported B&O speakers, it has a unique control system that lets you dial up and down the volume simply by rocking the speaker. Launching in November, expect to pay around £3,000 when it finally goes on sale – a small price to pay for both sonic oomph and chic style. You don’t think fashion or style when it comes to phone chargers usually, but this partnership between Ted Baker and mobile phone accessory maker Proporta changes all that. Finished to the brand’s luxury standard, these charging stands and cases let you charge your phone simply by placing them on to the wireless dock, no plugged-in cables necessary. And, unlike your usual charger, they’ll look mighty stylish left on your desktop surface. The original Amazon Echo was great at adding on screen visuals to the Alexa voice assistant speaker concept but, if we’re honest, its black boxy design was a bit ugly. The second generation Amazon Echo Show, with its new fabric-covered design, looks much nicer, and is smaller overall without scrimping on that same 10-inch HD screen size. Just by talking to the speaker, its built in AI Alexa smart helper can do everything from play your favourite song, start timers, play TV shows from Amazon Prime Video and control all manner of smart home equipment. And, for the budding cook, it makes a great kitchen accessory thanks to its library of video recipes. Love Sky TV programmes, but don’t want to commit to a costly satellite subscription? The Now TV Smart Box is an affordable way of getting pay-as-you-view access to loads of Sky TV content away from any lengthy contracts, with individual monthly passes sold to all the best TV and movie content that Sky has to offer. This latest version of the Now TV Smart Box is jammed full of techy features too, including 4K high resolution visuals and the ability to search for the show or movie of your choice using your voice alone. Projectors can be good fun for those big-screen cinema moments – but they can also be a hassle too. Unless you’ve got a dedicated movie room, you’re going to struggle with reams of cabling and finding an unobtrusive place to install them in. The Mars II portable projector from Anker takes the strain out of home cinema dreams, projecting a HD-ready picture up to 150-inches in size anywhere you like thanks to its built-in four hour battery life. And, with the projector running a version of the Android operating system that you’ll find on many phones, you won’t even need to plug in a DVD player – streaming apps like Netflix play and project straight from the projector itself. There’s no better time of year than Christmas for settling down in front of the TV, but if you’re perfecting the sofa-bum groove in time for the Doctor Who special, you’ll want to be doing so in front of the finest screen money can buy. 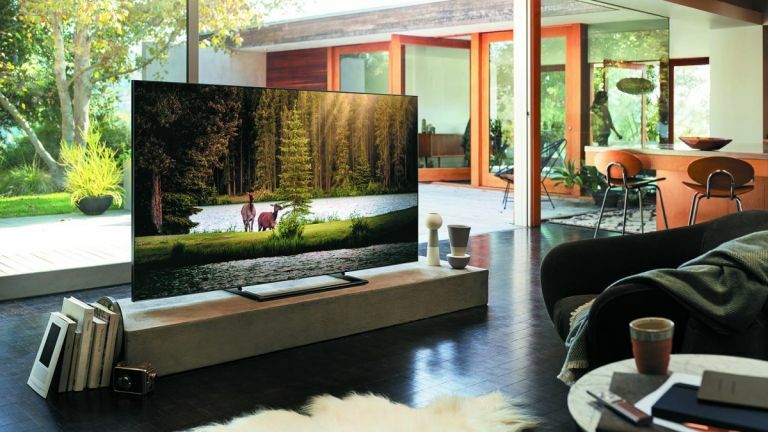 Simply put, the Q9FN range is the finest line of TVs Samsung has ever made – quite the praise given the company’s pedigree in this department. Available in 75, 65 and 55-inch sizes, it offers a spectacular image thanks to its rich 4K HDR panel, and features a stylish ambient option that sees the screen match patterns on surrounding walls when left in standby mode, letting it melt into your decor, rather than just being a huge black slab in your living room. What’s a great TV without some great audio to support it? If you want to hear with supreme clarity the dulcet tones of the Queen’s speech this Christmas, you’ll be hard pressed to find a better soundbar than the Samsung HW-MS650 to do it with. It may be over a year old (making it more affordable than at launch, too, and perhaps a Black Friday steal this year, too) but it remains the superior soundbar on the market, with physics-defying bass handling, incredibly powerful and punchy sound, support for lots of input sources and a massive array of streaming services including Spotify, Deezer, Tidal and more. The MS650’s one-body design offers a 3.0-channel (left, right, centre) mix powered a superb combination of six woofers and three tweeters - all powered by their own individual 20W amps. Though it’s not capable of delivering fancy overhead Dolby Atmos sounds, it’s otherwise about as good as soundbars get. Looking for a useful, simple stocking filler? Why not think about picking up a subscription to an online service for a loved one? They’re the sort of essential that’s a costly chore to maintain, but well appreciated as a gift – and easy to pick up last-minute, if you’d forgotten that special someone’s special preference. You’re looking at an average of £10 a month for most of the following services, though premium and entry-level accounts for some services are also available. Find more gifts for teenagers in our Christmas buying guide. Played around with drones before and looking for the next step up and away into the skies? The Parrot Anafi is the drone for you. Ultra compact thanks to its folding frame design, it shoots pro-quality 4K HDR video and can capture crystal clear 21MP photos. And that’s before flying the thing, with beginner-friendly controls letting you make high-speed, daring stunts way above your head. Want to bring some retro cool to your next party? The GPO Brooklyn Boombox is the only way to be playing Run DMC’s Christmas in Hollis this festive season. Aesthetically a dead-ringer for the 80s classic boombox, it’s got all the mod cons you could ask for from a contemporary music player, from Bluetooth connectivity to USB playback. It’s even got a CD player and a tape deck, as well as an FM radio, with a microphone input allowing for karaoke sessions too. It’s the office Christmas party on your shoulder.